Two weeks ago, I was all set. I would enter the Ravelympics. I would do the Sock Put. I would knit. I would win! I would sit there and bask in the glory (and warm feet) of gold-medal-worthy socks. But yet it seemed like a copout. A mere pair of socks in 17 days? Sock Wars veterans scoff. Clearly I needed a high start value to make an impression on the judges. Thus, I would knit a pair of socks of my own design, a design that’s been swirling in my head for a while and requires charting a non-repeating cable pattern. And then the move happened. In my packing haste (which made me miss my college days when it took two hours to pack and clean a dorm room), I forgot to set aside the sock yarn I intended to use. Right now it’s sitting in storage with the rest of the stash, to be retrieved at some unknown date. My knitter’s graph paper is in a box, maybe in storage, maybe in one of the as-yet-unpacked boxes in the apartment. Time for Plan B. I’d wanted to knit the Bayerische Socks for a while, and this seemed like a good time. Teeny tiny cables should be worth a high start value. I made a trip to Yarns 2 Ewe for some suitable yarn and cast on during the opening ceremonies. Of course, I cast on during the NBC tape-delayed opening ceremonies, which meant that I missed out on 13 hours of valuable knitting time. Which isn’t going to matter in the end, because I forgot to sign up for the Ravelympics in the first place. Which is just as well, because it’s one week into the competition and I’m still working the heel flap, even after shaving a few inches off the legs to make ankle socks (per my usual sock preference). 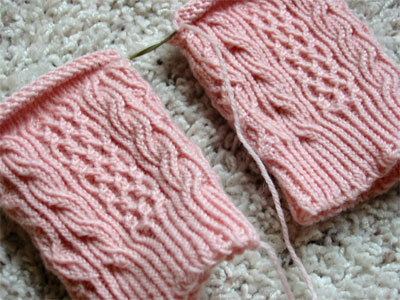 It’s taken me two days to work maybe six rows of the heel flap. In retrospect, it was a bad idea to pick a project that requires so much attention, as lovely as the socks are. It’s hard to work tiny twisty cables while Jason Lezak is running down Alain Bernard, y’know? CogKnition posted this on August 15th, 2008 @ 6:34pm in Knitting on the Web, Unfinished Objects | Permalink to "I Totally Win the Slacker Olympics"
It’s hard to work tiny twisty cables while Jason Lezak is running down Alain Bernard, y’know? That’s why I didn’t even intend on participating in the Ravelympics. Watching and knitting occasionally (without pressure) during the commercials is good enough for me. Beautiful socks. I want to do those sometime but keep hearing that they eat yarn for breakfast, lunch and dinner. FYI: If you still are interested. The Ravelympics Committee has decided to reopen sign-ups. The special tagging button will be working sometime tomorrow. I hope your transitional period evens out for you. Oh man! Yeah, I thought you could sign up on the first or second day of the olympics (just so long as you don’t starting knitting too early), but when I went to sign up they were all closed. Boourns. I still sort of have my project as a ravelympics project, I just don’t get to have the fancy decal on my page afterwards. Oh well.